Your account has been created successfully and please confirm your email id to continue the login. These Terms of Service (the "Terms") are intended to make you aware of your legal rights and responsibilities with respect to access of the SchoolVoice website at www.schoolvoice.com (the "Site") and any related mobile or software applications or web platform ("SchoolVoice Platform") including but not limited to delivery of information via the website whether existing now or in the future that link to the Terms (the "Services") or (the “Pricing”). In addition to the provisions of this agreement, browsing this website shall also be subject to the federal laws of the United Arab Emirates, local laws of the emirate of Abu Dhabi, and international conventions to which the UAE is involved. SchoolVoice may amend the terms & conditions of this agreement, provided a notice to this effect shall be displayed on this webpage. Amendments shall take effect once made. Your visiting of the website, following introduction of the amendments, shall be construed as full understanding and acknowledgment of the changes. You agree to access and use the site only for lawful purposes, and that you are fully aware of all laws, statutes, rules and regulations pertaining to your use of the site. Certain portions of the site are limited to registered users and/or allow a user to request support or services online by entering personal information. You agree that any information provided to us in these areas will be complete and accurate, that you will not register under the name of, nor attempt to enter the site under the name of, another person, and that you will not adopt a user name that SchoolVoice may deem as offensive. Upon registration, the School is responsible for maintaining the confidentiality and account credentials (user name, email and password) for their account from any devices. The school should agree to accept responsibility for all activities that occur under their account. SchoolVoice shall not be responsible or liable, directly or indirectly, in any way for any loss or damage of any kind incurred. If links on the SchoolVoice site exist, we declare lead to websites that are not operated by SchoolVoice. SchoolVoice does not control these websites nor do we review or control their content. These links are not an endorsement of products, services, or information, and do not imply an association between us, SchoolVoice, and the operators of the linked website. Although SchoolVoice cannot monitor all postings on the site, we reserve the right (but assume no obligation) to delete, move, or edit any postings that violate these terms and conditions. UAE and foreign copyright laws and international conventions protect the contents of the website(s). SchoolVoice may, in its sole discretion, terminate or suspend your access to or use of this site (the “Administration Web Portal”) and (the “SchoolVoice site) without a prior notice for your violation of these terms and conditions or laws applicable in the UAE, or for other conduct, which SchoolVoice believes is breaching agreement terms. In the event of termination, you will no longer be authorized to access the site. SchoolVoice will not be liable for any incidental, indirect, special, punitive, exemplary, or consequential damages, arising out of your use of or inability to use the site, including without limitation, loss of revenue or anticipated profits, loss of goodwill, loss of business, loss of data, computer failure or malfunction, or any other damages. SchoolVoice has no control over the third party applications, products, services, software whether they are on Apple Store or Google Play Store and we are not responsible for their performance, do not endorse them, and are not responsible or liable for any content, advertising, or other materials available through the third party applications, products, services or softwares. 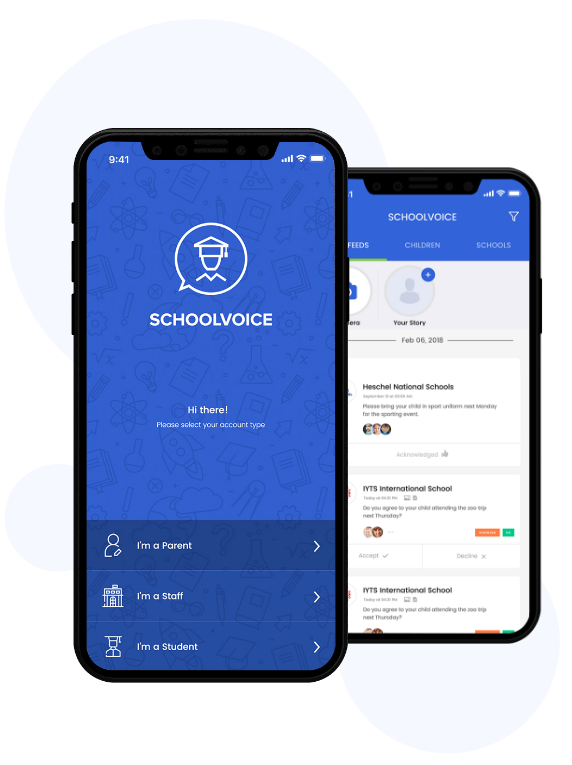 SchoolVoice is not responsible or liable, directly or indirectly for any damage or loss caused to you by your use of or reliance on any goods or services available through the third party applications, products, services, software and the Apple App Store. You expressly understand and agree that your use of the site, or any material available through this site, is at your own risk. Neither SchoolVoice nor its employees warrant that the site will be uninterrupted, problem-free, free of omissions, or error-free; nor do they make any warranty as to the results that may be obtained from the use of the site. The content and function of the site are provided to you "as is," without warranties of any kind, either express or implied. SchoolVoice services is used internationally. Our estimated time of delivery may be affected depending on the load on our websites, web portal, application (Android and/or iOS platform) including any networks and servers used to provide services by SchoolVoice. In case there is any problems with the estimated delivery, we will contact the concerned party and resolve the issue as quickly as possible. We will make every effort to keep the concerned party informed about our investigation where appropriate. Please refer to other SchoolVoice policies and procedures on our site. A trial period of 3 months is given to the school interested in trying our services. If the school would be interested in cancelling the trial period that would be permissible. Schools may cancel the subscription provided by SchoolVoice at any time during the trial period and will not be billed or charged. On the last day of the (free) trial period, unless the School cancelled the subscription, they will be automatically charged the applicable subscription fee, in this case, “Paid”. Refund of “Paid” will NOT be made whether a payment was made by cheque, debit/credit card or any other payment means. Please note, every case is subject to evaluation by the underwriting department of SchoolVoice.